The North American Aviation BT-9 was a low-wing single piston engine monoplane primary trainer aircraft that served with the United States Army Air Corps (USAAC) and other allied countries during World War II. It was a contemporary of the Kaydet biplane trainer and was used by pilots in Basic Flying Training following their completion of Primary in the Kaydet. In United States Navy (USN) service it was designated the NJ-1. The BT-9, designated NA-19 by the manufacturer, evolved from the North American NA-16, which first flew in April 1935. The BT-9 design first took to the skies in April 1936. Fabric covered the movable surfaces on the tail and wings, as well as the sides of the fuselage from just behind the firewall to the tail. The remainder of the aircraft was metal-covered and featured fixed (non-retractable) landing gear. The Army Air Corps purchased a total of 199 BT-9s, BT-9As and BT-9Bs. Many foreign countries also used variants of this aircraft. An improved version was the BT-14. It featured a Pratt & Whitney R-985 Wasp Junior engine versus the Wright R-975 Whirlwind on the BT-9, as well as metal skin replacing the fabric on the fuselage. The NA-64 model retained the fixed undercarriage layout and was built for the French in 1939-40. Just under half were delivered before France surrendered to the Nazis and the remaining aircraft were purchased by the Royal Canadian Air Force (RCAF). The RCAF named the type the Yale, and were used initially as intermediate pilot trainers and later as airborne wireless radio trainers. All were sold as scrap post-war but approximately 40 survive today, with about 15 in airworthy condition. 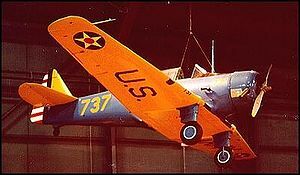 The NA-26, an improved model with retractable landing gear which became the prototype for AT-6 Texan advanced trainer, was developed from the NA-16 design. The Australian CAC Wirraway was also developed from the NA-16. France and Canada, 230 aircraft order. 111 were delivered to France before the surrender in 1940. The remaining 119 aircraft were acquired by the British and delivered to the RCAF, designated the 'Yale'. There are many surviving NA-64 Yales today because of Ernie Simmons, a farmer from near Tillsonburg, Ontario. Simmons bought over 30 Yales in 1946 and kept them on his farm until he died in 1970. These aircraft were subsequently auctioned in 1970, and have been restored by museums and warbird enthusiasts. Most of the Yales currently in existence came from the Simmons collection.